Interesting, thanks for the numbers! Its sea level thrust is the same as Raptor’s vacuum thrust which is interesting. I know raptor will have an impressive chamber pressure for its size so these engines must be larger than the raptor family intend to be. I know raptor will have an impressive chamber pressure for its size so these engines must be larger than the raptor family intend to be. 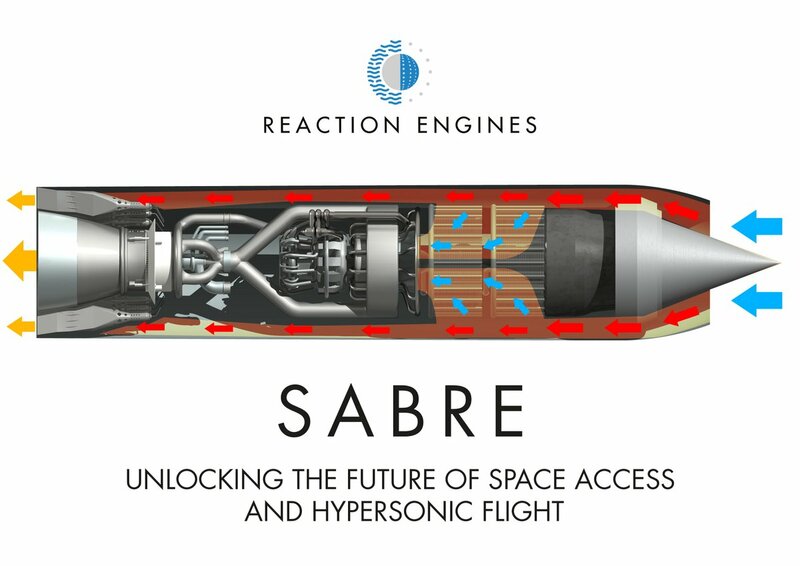 A Sabre “engine” has four rocket chambers fed by a common set of plumbing that does the magic of collecting and delivering atmospheric oxygen. Falcon 9 is a more appropriate comparison than Merlin or Raptor. I was commenting on how it was interesting that the airbreathing sea level numbers are greater than the sea level raptor numbers. Considering the typical TWR for airbreathers is quite low and it’s using hydrogen as fuel which isn’t helping. It’s even more interesting that in a vacuum where when it’s running as a true rocket engine it has nearly a MN more thrust than raptor. Though I guess seeing it as 4 different chambers to 1 “engine” it makes a bit more sense how they manage that. Didn’t know about the 4 chambers though. Interesting design choice. I wonder what the cost to exhaust velocity is due to each chamber not having an individual nozzle. I wonder what the cost to exhaust velocity is due to each chamber not having an individual nozzle. This engine is extremely Kerbal. Back in the day before the rapier engine B9(one of the best modmakers in the game imo) modeled the sabre and it was a game changer for SSTOs because of the dual mode. Thanks. You keep answering my easily googlable questions and I really appreciate it. My life is in the fast lane right now but I enjoy talking rockets so it’s fun for me to stop by and comment before going onto my next task without another thought/background research so thanks for keeping it up. Agreeing with @Sab1e about Sabre because that cad model is magical. Entertainers like to entertain. Politicians like to politic. Engineers like to engineer. The British really like to engineer. Personally, that picture makes me cringe, and I hope that future generations of the engine will accomplish the same result with a much simplified implementation. it’s a cluserF that’s for sure. 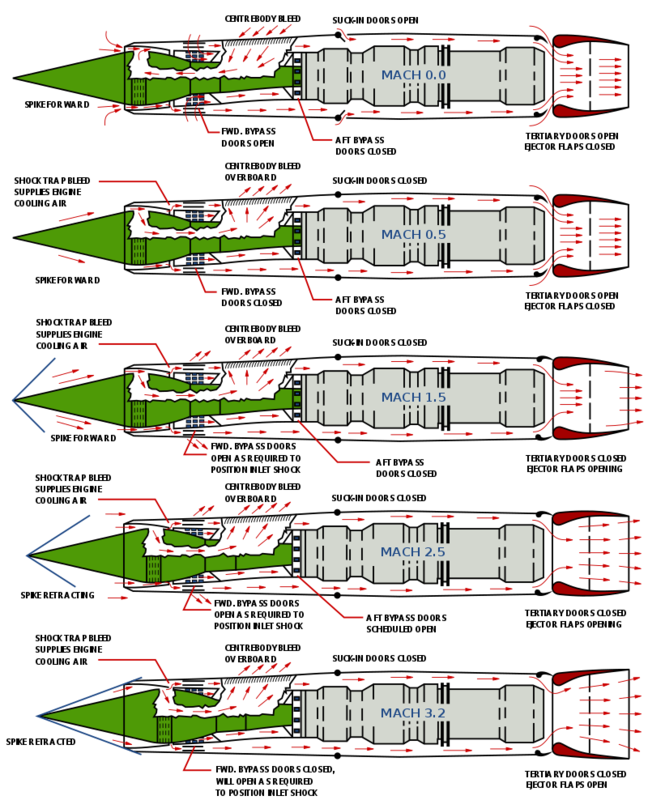 On the topic of sabre that plumbing is nuts and it doesn’t even show how they plan to switch from atmospheric ox to onboard which can only be a nightmare in the middle of that birds nest of piping. Definetly very interesting. Anyone saw a full piping diagram? What are those things rendered in white arround the engine nossle arrangement? I think its the bypass for the low speed regime of flight(0-mach1). All jet engines(that I’m aware of) have some sort of air bypass system. 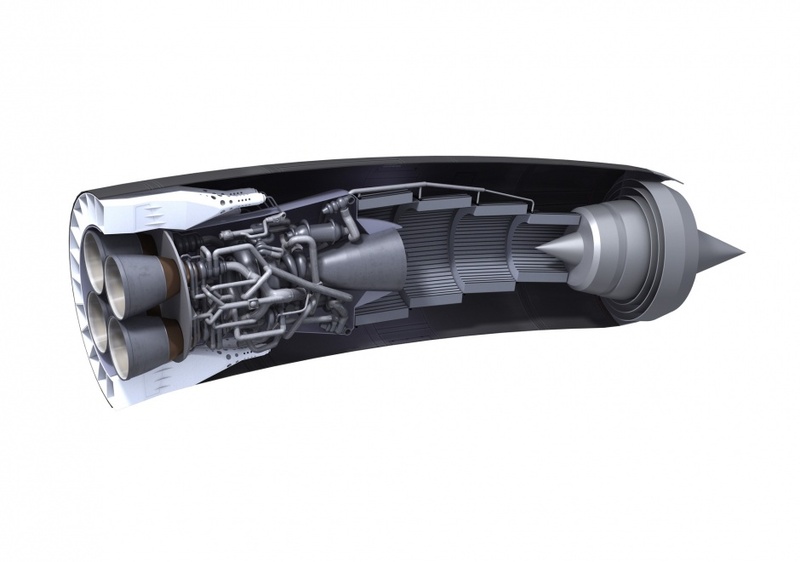 Low bypass systems are typically high performance high thrust engines(think fighters) and high bypass systems are low thrust higher efficiency and are typically called turbofans because most of the thrust is generated from the fan that pushes air through the bypass system. They burn fuel to turn the fan and to heat some of incoming air to create more thrust. It’s interesting that it seems to only have small lines running to the main plumping…but I see holes where ambient air could enter. An example of a low bypass engine that I was drooling over the other night is the J58 from the SR71. You can see that it’s very low bypass and most of the air goes through the “combustion chamber” where air is mixed with fuel and ignited. Where as with a typical high bypass turbofan most of the air goes around the chamber and is just mixed with the hot combusted air and pushed out the back from the fan. That’s something that always weirded me out with rocket engines. The concept is relatively simple: mix the bipropellants, ignite them and let it get out by the nozzle - with a few subtleties like regenerative cooling or a turbopump. And yet the result is always a scramble of complexity. Same thing with jet engines, or any engine in fact. Professionally, I met the same thing on pretty much any software project ever, though I now suspect it’s everywhere the same. 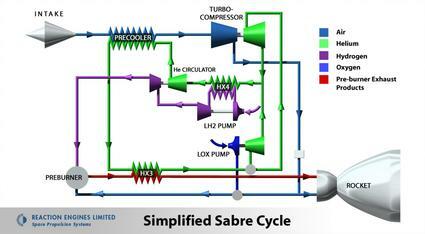 So how much of the SABRE’s apparent complexity is really over-engineering? I was confused by that as well. As Skyentist observes, the engine has an air bypass design, but the white thingies lie in the bypass, so they don’t make any sense as a jet bypass system. They are, in fact, “spill duct ramjet burners”. They burn excess hydrogen in the bypass air, and that apparently reduces the negative effects of the bypass stream. In contrast, a high-bypass turbofan considers bypass air an essential part of the engine’s design because it generates most of the engine’s thrust. @QuinnKupec @SpaceX @UofMaryland Yeah, exactly! Would be great to hear your thoughts. We’re going to try a few approaches. Can def be done, just about minimizing mass. An “ultra low” coefficient means “very high drag”. A vehicle that wants a high coefficient would be a nuclear weapon, which wants to lose as little energy as possible during reentry. It seems to boil down to an inflatable heat shield, possibly with some ability to be dynamically tuned. The University of Maryland paper is talking about an umbrella structure that gets deployed during reentry. It uses ceramic fabrics to handle heat up to about 1100 C, and can also be moved to fool with the lift and drag characteristics of the vehicle. That said, I suspect that SpaceX is just trying to deal with the heat problem, and a big inflatable bag using ceramic fabrics would probably do the job just fine. NASA has spent years working on inflatable heat shields for their missions to other planets. This is kind of what I was thinking. That is, you’d be able to reuse your BFR many more times if the reentry speeds were significantly reduced. It would also give you some redundancy for reentry. Overall, I can see a lot of strengths to this concept. BFR enters an atmosphere, deploys a very large inflatable heat shield to reduce most of the speed, then at a certain velocity that heat shield is ejected. After that, the normal heat shield does the rest of the slowdown, with most of the “damage” done to the inflatable heat shield, which may or may not be reusable. It’s after seeing the graphs of temperature and deceleration that I really had this sense. It’s a similar deceleration rate, but at a much earlier point in reentry. And if the balloon fails, you still have a super reusable heat shield. Interesting past and recent tests of supersonic parachute deployments. On a side note, I’m taking a class next semester on EDL and the prof worked on the supersonic parachute for curiosity. I hope you guys don’t mind waiting 5 months for their opinion but I will definitely ask for it. I see the heat problem being addressed in two possible ways by an inflatable structure. Put a ring at the base of the stage, in that lovely dead space between nozzle and the rest of the structure, that inflates out to the sides. A torus. It doesn’t protect the engine nozzle, but it does reduce the ballistic coefficient so that the engine nozzle experiences the heating of a first stage nozzle. Then you don’t need to remove the inflatable. It stays with the stage right to the ground, helping all the way. The landing legs are a complication, but I suspect that in the second approach, the inflatable can be depressurized and the legs can just deploy over top of it. Done cleverly, the landing legs could be part of the deployment of the inflatable structure. Edit: I looked high and low for the second video that Skyentist just posted. That’s what I’m thinking of when I talk about a torus as the means of reducing the ballistic coefficient. Have no idea what I’m talking about, but the reentry doesn’t need to be done on the nozzle facing end, they can put a heat shield on the front end of the second stage, deorbit, deploy the balloon and maybe even catch the stage instead of landing it on legs. I think once the tanks are empty the centre of mass is right at the engine, and it’s naturally going to want to enter CoM first. Trying to get it to enter the other way around would be tricky.